It's time for fun in the sun! 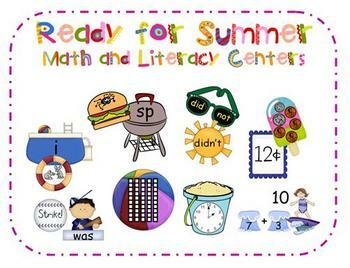 Let these colorful, summer-themed centers help make learning fun in your classroom!! 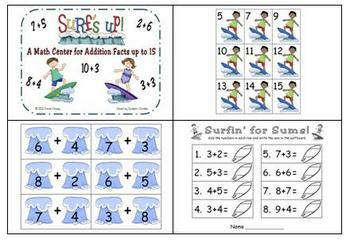 This 80-page packet includes 8 (4 math and 4 literacy) full color, easy to use centers! All centers are great to use in a pocket chart or as a table game, and each center (except one card game)comes with a worksheet or recording sheet to hold students accountable for their learning. Sight Word Strike Out - students draw cards and read the sight words, trying to avoid a "Strike" card. The first 30 words from the Fry Word List are included, as well as blank cards for you to write on. 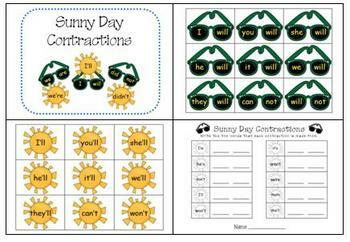 Sunny Day Contractions - students match the contractions on the suns with the sunglasses with the pairs of words that they are made from. Fun in the Sun Long Vowel Sort - students sort the pictures in the life rings with the swimming pool with the number of syllables they have. Barbecue Blends - students sort the pictures on the burgers according to the "s" blends they start with. Each center is also for sale separately, but at $2.00-$3.00 each, this packet gives you the biggest bang for your buck! Enjoy!